This Smart combined portable meter is extremely suitable for any multi-use and is especially designed for quick measurements. The instrument is supplied complete with combination electrode, a 9V battery, instruction manual and a sachet with calibration solution for pH and Conductivity. Milwaukee's BLUE range of waterproof testers supercedes the IP97 range and represents the NEW WAVE of pocket-sized pH, Conductivity & TDS meters. These waterproof testers incorporate one of the WORLD'S FIRST user-replaceable electrodes to increase the LONGLIVITY of the instruments. These light-weight testers are built for RUGGED use and WET APPLICATIONS. The waterproof pH tester comes with a 2 point manual procedure for direct calibration to eliminate the difficult push button system used with other meters in the waterproof range. The SMS310 Smart Conductivity Monitor is designed to continuously monitor conductivity values directly in your reservoir. The SMS310 is usually mounted on the wall with the probe immersed in the nutrient reservoir. The Sharp testers are microprocessor controlled, automatic calibration, rugged one piece splash proof casing. Two good quality meters made by Eutech Cybernetics. pH scan 1 Microprocessor based pocket pH tester measuring 153x42x23mm. Measures from 1.0 to 15.0 pH with an accuracy of +/- 0.2 pH. Easy to read digital display, up to 70 hours use from internal batteries (Ever ready EP675E) automatic power off, operating temperature 0-50 deg C. 90 gram weight. 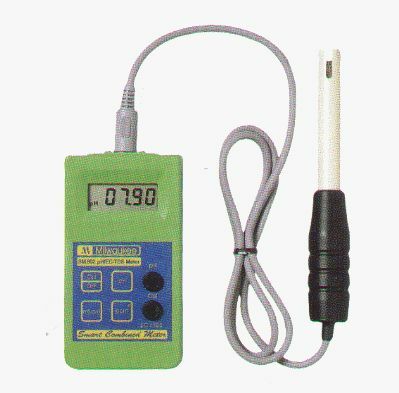 TDscan Pocket sized conductivity tester suitable for measuring between 0-19.90mS. 152x42x23mm, automatic temperature compensation, +/- 2% accuracy, up to 200 hours use from internal batteries (Every ready EP675E), 90 gram weight. A useful addition to any growing environment will be this digital light meter. Perfect for setting up lights, experimenting with reflected light, making the best use of ambient light, etc. pH Pro pocket tester features state of-the-art electronics,together with a large, easy to read 8mm, 31/2 digit liquid crystal display. The pH Pro utilises a glass measuring electrode, in conjunction with the reference electrode and two point calibration, to provide a guaranteed accuracy of +/- O.O5pH. 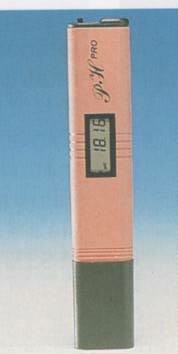 The pocket tester measures over the range of 0 to 14 pH, with a resolution of 0.01 pH, and an accuracy of +/-0.05 pH. The readings are automatically compensated over the operating range of 0 deg C to 70 deg C.
These easy to use IDS pocket testers provide the ideal solution for measuring ppm or umho The pocket tester is suitable for monitoring a variety of applications including, the amount of salts or dissolved solids in water. Range 19,000 umho, 100 umho reading. State of the art conductivity 'truncheon' from Hydroponics International (New Zealand). 2 year guarantee. 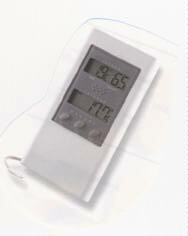 Professional grade Ce meter designed for commercial use. 40cm long with carrying strap (not shown). A useful instrument with a dual LCD display showing both indoor and outdoor temperatures via an external sensor, together with a memory function to record the highest and lowest external temperatures. Indoor relative humidity (RH) is displayed on the upper LCD, expressed as a percentage. Temperature range: Indoor: 0 deg C to 50 deg C, outdoor -50 deg C to 70 deg C, indoor RH range 25%-95% @ 25 deg C, 3vdc, 2 x AA batteries req'd, sensor length 3 m, 154x82x20.5mm, weight 140gms.